Use coasters and cutting boards when using your stone countertops. Spills should be blotted up with paper towel (not just wiped) and rinsed with clean water. Lay mats at all entry points if you have natural stone tile to protect your floor’s finish. Do not place excessively hot objects directly on the surface of your stone countertop. Some stones contain minerals, which will crystallize under extreme heat, causing a discoloration spot, which is almost impossible to remove. 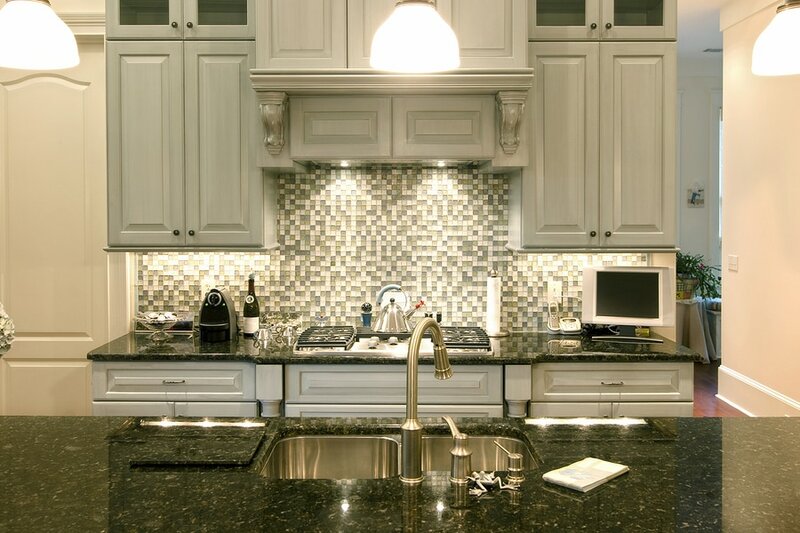 We always suggest the use of trivets on your granite or marble countertops. Acidic substances, such as citrus juice, will degrade the Sealer, leading to potential staining and etching. Spills blotted up with paper towel within a few minutes will likely not cause any issues. Extra caution should be taken around marble and travertine because acidic substances damage them much more quickly. Oil will penetrate the surface of some natural stones and discolor or leave them looking dull. 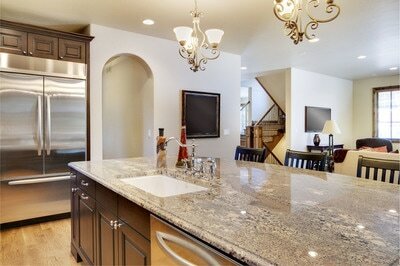 If you do happen to spill oil or grease on your stone countertop, clean it up as soon as possible. Most metal objects won't scratch your stone countertops. Though you should still lift and then set down metal objects instead of dragging them across the stone surface. You always want to take as much care as possible when you're dealing with hard metal objects, including pots and pans when working around your beautiful granite countertops. Our granite countertops are not only very beautiful, but they are also very resilient and very durable, and extremely hard to ding or scratch. That being said, anything can happen if a heavy and hard metal pot is dropped in a weird angle on your granite countertop, and this is what you need to do your best to protect against. In most cases, even a strike like this will not do any damage, but it is always best to err on the side of caution. Diamondsare used to cut granite and other natural stones, therefore wedding rings with diamonds will scratch your stone countertops. Avoid rubbing or hitting your ring on the surface of the stone. This is likely a rarity and will likely never happen, but it's good to be aware of one of the few threats to to integrity of your natural stone countertops. Though very durable, both natural and engineered stone can chip, flake, and crack under excessive abuse, such as standing or walking on your countertops or hitting them with a hammer. 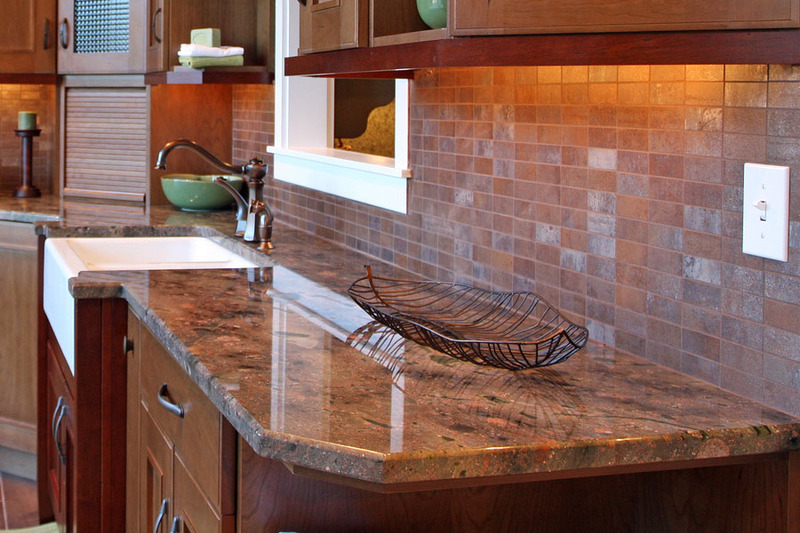 Essentially, treat your countertops with respect and they'll provide years of easy to maintain beauty. That being said, it is not something you really have to concern yourself with on a daily basis. During most normal activities in your kitchen such as cooking or dining, you will not have to worry about damage to your countertops. Most of our clients have had their natural stone countertops or bathroom vanities for well over a decade, and never had the first bit of damage or any problem to their surfaces. It is just always best to take normal care when working on or around your counter tops. With proper care natural stone countertops should not need resealed for few years. The way to tell if resealing is required is to puddle a little fresh water on the surface. If water beads up on the surface - resealing is not required. But if it disappears into the surface leaving a dark spot, resealing is needed (the dark spot will go away as the stone dries). You can have your countertops resealed by a professional stone restoration and maintenance company, or you can buy a natural stone Sealer from your local hardware store and follow the manufacture’s instructions for application. Mild soapy water with a soft cloth or sponge is all that you need to keep your countertops clean. Regular household cleaning products contain ammonia, which will degrade the Sealer and etch the surface of natural stone. Rinse the surface with fresh water after cleaning. This will help avoid the buildup of soap residue over time, which would give a dull appearance to the surface, or simply use a natural stone cleaner from your local hardware store. Here is some more information about cleaning granite countertops that will be helpful in the education process.